Interesting. 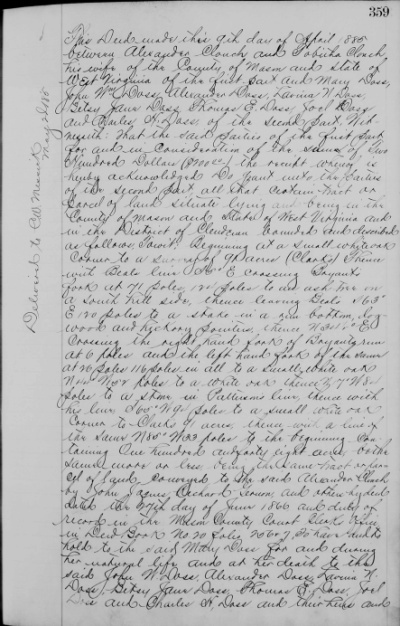 What do the tax records for the county (if extant) say? Is William paying taxes on the land? Are there mortgage records available in your county of interest? Tax records (land tax assessments and personal property tax) still have the little key over the camera icon. 😦 No idea if mortgage records are available. I did check the WV Property Viewer and found a 76.5 acres lot owned by a Patterson couple. In the middle of this lot is a one acre square classified as exempt from property tax and used as a cemetery and owned by Clonch Cemetary. I think it very likely this is the location of the land. Thank you, Cathy. Your question had me searching again and finding a resource I did not know was available. Do you know the name of the Patterson? 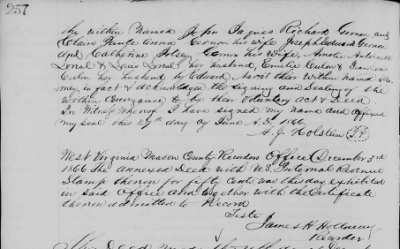 I seen it mention in the deeds…wondering if it is family member. 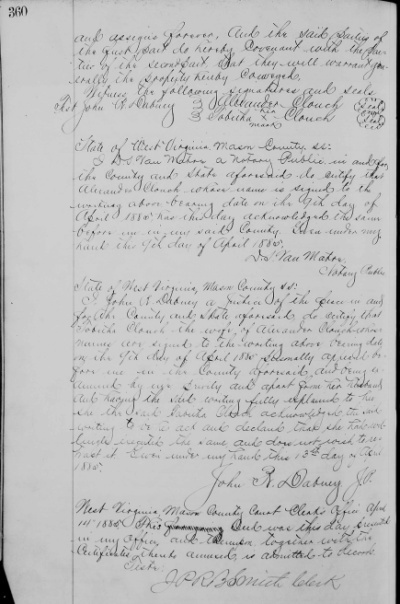 The Estate of William Clonch (1807-1863) of Mason County, West Virginia – Part 2. 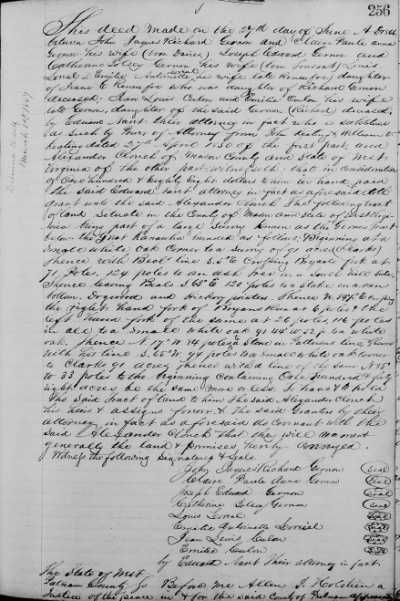 Lovinia Ann CLONCH (1846-1945) and her husband James William PATTERSON (1836-1911), son of Jacob PATTERSON and Mary GARNER. Thank you for stopping in. You are amazing, Amy. Thanks so much for looking this up and including the link. After replying to Cathy’s question above (she is also a Cathy Dempsey but no relationship to me) I found the most amazing site, West Virginia Property Viewer. You’re welcome. My legal training should come in handy occasionally! I am sure there is more information out there about West Virginia during that period. What I don’t know is whether there would have been some way of recording a claim to adverse possession. I have no idea when it comes to legal stuff. I’ll leave the question of adverse possessions to others who may be more interested. I think you are on the right track with the land deeds. Personal property tax lists could really help with this problem. Do you have a Family History Center or affiliate close to you? There appears to be a FHC in Luxembourg according to their Wiki. I’ve never been there. Actually the address is different than the last time I looked it up. They are only open on Fridays from 5.30 pm to 7.00 pm but this needs to be confirmed as hours change. Thanks for the suggestion, Linda. I love how you make use of land records. I am so far from getting to that point. Thank you, Luanne. I never thought I would get to this point. DNA analysis, as well as BMD and census records, keep me busy especially since I am trying to do citations (for records found in the past 25 years). Sharon, I was thinking about leaving it at this point but from the suggestions I’m getting it sounds like no one wants me to stop. 🙂 Thank you! A lot of this research and questions mirrors similar research/questions I’m doing/have for the Kirks (especially in West Virginia before it was West), so I’m very curious to hear about answers you uncover. I’m also interested in learning more about how you’re using the WV Property Viewer site for historical property. I’m toying with the page now, but wonder how you’re making it work for your research. I knew you would ask. I’m working on a post in relation to this one research question and the viewer. I’m seeing more possibilities but won’t be going into detail on them. I might mention a few things I noticed which would be helpful on the site. Thanks, Michael. Sounds good. I’ll be looking forward to future posts.